Last April, three weeks after Bruce Jackson was named to his current position at Microsoft Corp. as Lead Counsel supporting Global Sales, Marketing & Operations for the U.S. Commercial Enterprise Group, TNJ Executive Editor Rosalind McLymont sat down with the former entertainment lawyer at his offices in New York City for a wide-ranging interview in which he talked about his 18-year tenure at Microsoft and shared his views on diversity and inclusion, leadership, mentoring, the tech environment, the state of the Black American community, and his personal passions and success drivers. 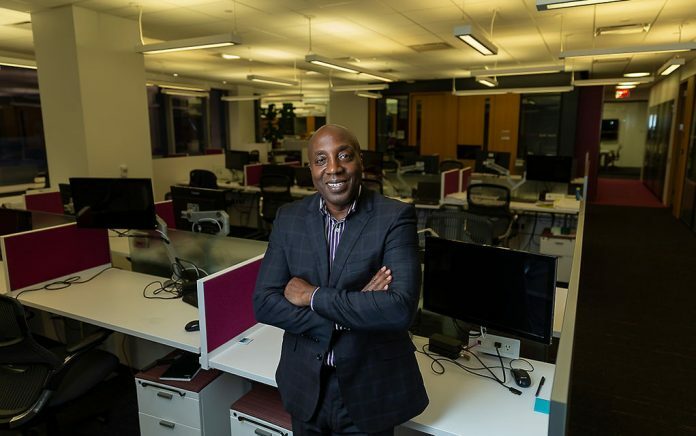 Jackson’s role makes him the chief legal adviser to Microsoft’s African-American president of U.S. Regulated Industries, Toni Townes-Whitley. TNJ: What is your greatest challenge in your new role? Jackson: The challenge is digital transformation. With digital transformation you’re talking about data—people’s information—and all around the world people are coming up with privacy regulations. That’s challenging when you try to enter into deals with companies because they have to comply with all the privacy laws wherever they are. In addition to that, there’s the whole regulatory landscape. If it’s not privacy, it’s regulatory. You have to make sure that you understand those regulations and make sure the owners of companies building our products adhere to privacy and regulatory issues. So we’re building from the ground up with those issues because they’re constantly rolling out new regulations. The cloud and digital transformation and artificial intelligence – it’s all new. You even have the government now saying it will start to look at AI because you can use it for good and you can use it for bad. So you need people to regulate how it should be used. All of those issues are complicated and challenging, but we have to all get through it so we can actually move to this world that we’ll be in pretty soon. Challenge is nothing more than opportunity, but it’s nonetheless a challenge. TNJ: How did Microsoft find you? Jackson: It was eighteen years ago. I was working in entertainment law and someone told me that Microsoft was looking for someone with entertainment experience. If you go back eighteen years, you’re talking about the year 2000 and Microsoft was really just a tech company. Then you had Napster [the pioneering online music store subscription service] come out; the Digital Millennial Copyright Act came out and that was all about content. So when I joined Microsoft, it was really about entering into deals with different content providers, which included the film industry, music industry, publishing industry, and that was actually what I was practicing on my own. They wanted someone with knowledge and experience in that. TNJ: Did you have any kind of technology or digital background? Jackson: I had no digital background, but part of intellectual property is copyright and trademark. And so in entertainment law you deal with copyright and trademark. I was familiar with that, not necessarily the development of technology. But the development of music is the same thing, right? Just a different product. TNJ: But why Microsoft in particular? Jackson: One, Microsoft is a huge company. Their mission, from the time I started, was empowering people to do better, to do more. The impact that you will have around the world by just working with Microsoft and working with the technology is exciting. It’s about being in a position to create things that people can use; being part of a machine that creates things that people will use all around the world and your play a role in that. TNJ: How does that tie in with who you are personally? Jackson: Diversity and inclusion is extremely important to me. And how that ties into it is, to make sure that sector has access to technology, because technology is really there to make people more productive, more efficient. Just the use of it gives you a competitive advantage. Typically, in the diverse population we don’t see as many in the technology field. So I want to make sure that I create a pipeline, that there will be more. TNJ: How would you characterize your management style? Jackson: Empowering. I empower my people to do their job and provide mentorship if necessary, but certainly guidance and support. And I certainly believe in making sure they get all the resources they need to be successful. So I would say the key thing is, I believe in my people and I empower them to do their job. TNJ: What qualities are essential for effective, impactful leadership? Jackson: Hard work. There are no shortcuts. You also have to understand the business that you’re in. If it’s practicing law, you want to know the business as well. You can be a lawyer without knowing the business, but you’re not going to reach your full potential unless you know the business aspect of things. So you want to learn as much as you can. In addition, you want mentors. And you need a sponsor—someone who’s willing to invest political capital in your success, in your career. Putting your head down and working hard is one thing, but you also have to be mindful that you want people to know who you are. So you have to raise you head and get to know everyone because your sponsor or mentor doesn’t have to look like you. Often times, in corporate entities, there may not be too many of us to play those roles. TNJ: When you recruit, what soft skills do you look for? Jackson: I look for someone who is just curious about things. To me that’s important. You may not be experienced in all the technology but someone can teach you some of that, but if you’re hungry, determined, a hard worker, and if you’re curious about learning—those are the intangible things I look for. TNJ: What is the most memorable moment of your career here? Jackson: There are several in terms of memorable moments. I’d say one of the most is just getting companies to move to this thing that we call “the cloud.” This is a great moment because you see the whole digital transformation of companies moving from where they are to transforming their entire organization. That’s exciting. Personally, in addition to that, what’s exciting? The fact that we had a very diverse team of 22 lawyers based in the United States, and around the United States, supporting an $18 billion business. That’s something I will not forget. TNJ: When you look at the number of Black founders and the kinds of things they’re doing with technology, the kinds of startups they’re creating, do you get the sense the “digital divide is shrinking? Jackson: When I look at people who are developing products and products that are out there in the commercial industry, there aren’t many of us. The fact that we’re starting to get involved is a good thing. But it’s a bigger issue in that once we develop something, then you get into angel funding. Do we get funding the way everyone else gets funding? Is it out there for us? It’s a start, we’re better off today than we were yesterday, but we still have a long way to go. When you start looking at computer science in the schools, there are just not a lot of us focusing on computer science. In terms of African-Americans the percentage is extremely low. Women in computer science in the African-American community—the percentage is extremely low. When do you start focusing on a pipeline? My philosophy is, you start as early as you can to get people excited about it. You can’t go to high school and say, “Hey! Computer science,” and you haven’t really taken all the computer science courses up until that point, or science and math up until that point. So you want to start getting people excited about developing robots, or whatever it takes to get them excited about technology because that’s going to be the future. TNJ: The Black Community: how are we looking? Jackson: Oftentimes we may get to the point where we think we want to be “that person.” My philosophy is, No! Just bring someone else along on this journey because you’re not going to always be in this position. And when you leave, you don’t want to have any regrets that you didn’t reach down and bring people along. That, to me, is the key. And bringing smart people—not being fearful to bring smart people on the team because they make you big, better. At the end of the day, when I sit on a bench and feeding birds, I don’t want to say to myself, ‘I regret not doing what I should have done when I was in a position to do it.’ Don’t have that regret. A lot of it has to be in the household and the priorities in the household. What’s the expectation for them? Also, other Black professionals, we tend to move out and don’t really get involved. We have to somehow reach back and get involved, not just for those who are the next doctors and lawyers; there are other folks out there you can save, too. You have to have that personal responsibility. You didn’t make it on your own. I don’t care who has been successful. There are many other people who had a hand in making you a success. My parents weren’t professionals. My motivation was always fear of failure. I had a great mother, but I would say I wasn’t really pushed. It was just me saying, “I want something better.” What kept me going was the fear of failure. What I mean by that is, knowing what the outcome would be if I didn’t do the things that I did just based on the people that I grew up with. I grew up in the New York projects. It was a low-income cycle. It’s designed for it to be that way. It’s not designed for you to escape that environment. I saw that and said within myself, “this is not where I want to be.” We’ve had escapees, but not enough. It takes a lot of work and a lot of determination because the resources are just not there, nor the support. TNJ: How do you like spending your personal time? Jackson: You ask most people about me and they’ll say, “Bruce doesn’t do anything but work. He doesn’t have a good work-life balance.” One of my passions is real estate. Renovating homes or apartments. That’s a passion of mine. Where does that passion come from? There’s always a desire, a fascination about real estate. It’s not like I grew up in a house. But that takes time, too. And that’s work. In terms of relaxing, I’m getting better at that now. I’m realizing the importance of that. But generally, most people would describe me as a workaholic. When people say, “what do you like to do outside of work?” I have to think about it. TNJ: What would people not like about you? Jackson: Professionally? People would say that Bruce will go out of his way and help and share his knowledge without fear of someone stepping into his position; that Bruce will always make time to talk to people about career development, career growth and opportunity. What would people say that they don’t like? Well, they certainly don’t say it to me so I can’t tell you. It certainly would be on a personal note. People would say, “Hey, you work too much. You don’t have time.” Personally that’s what I would get. My three daughters are going to say, “Dad’s going to work all the time and if he’s not working he’s on the phone all the time.” They have become accustomed to that. That’s just who their dad is. But I’m there to give them advice, guidance, and give them an example. We don’t talk about success. They’re going to do what s necessary because they see me, my friends—they’re in an environment where that’s just what it is. TNJ: Let’s sum you up. Jackson: I’m all about creating a pipeline of the next diverse group of folks—giving them access. Supporting this new president [Toni-Townes-Whitley] feeds into that. I’m all in and my job is to make her successful because if she’s successful it certainly creates the pipeline for the next opportunities for African-Americans to be presidents of companies like Microsoft. I’m excited about it and I decided that I really want to go for it because I have an opportunity really to help her create something great in terms of a pipeline.